All our tents have 2″ seatbelt on every seam, top to bottom with steel to steel connections. Every seam is triple stitched with #207 polyester thread. This is about four times stonger than what most companies use, which is a double stitch with #138 thread. Click here to see a details description of the construction of our high quality pole tents. Our manufacturing crew is really stable and dedicated. We have multiple empolyees who have been with us for over 20 years. As a result, they have become world class in what they do. Each has become his/her own best critic. 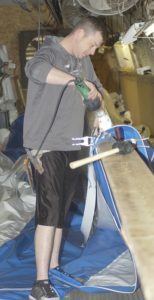 Nevertheless, the work is under constant inspection by others all the way through the production line. Finally we are continually testing and proving the product on our 4-acre proving grounds, where we have permanent stake lines. 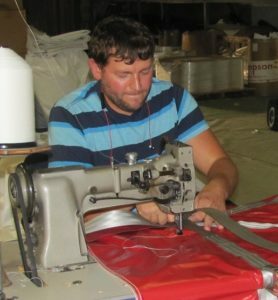 We have invested in the very best tent manufacturing equipment. 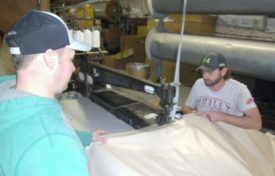 Most of our machines and fixtures are built or rebuilt especially for us – or by us – so we can manufacture a superior pole tent. As a result, we routinely fabricate a 40′ x 60′ tent in 12 man hours. Then we turn around and spend some 9 man hours vulcanizing, or “welding”, vinyl weather stripping over every seam. Every stitch of thread in the tent top is permanently protected. The efficiency of our commercial tent production line owes much to the fact that the building was designed especially for our use. We laid out the floor plan and then planned the shape, size and height of the building. For example, we have two electric traveling hoists that run the length of the 25′ high ceiling, making the extra large tents almost as easy to handle as the smaller ones. All tent portions, including side-wall, are sent in tough, over-sized vinyl bags with permanent handles on the four corners. Even a 60′ tent half can be carried away by four average men. We now include a 2″ 12,000 lbs. trucker’s ratchet for 30′ and wider tents. This makes it convenient for one man to tighten the tie-down ropes on any tent. You’ll wonder how you ever got along without them. 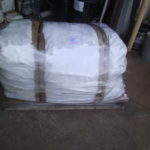 Our normal shipments are palletized, steel banded & wrapped. 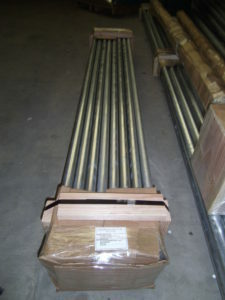 Quarter poles and wall poles are bundled together and wrapped in cardboard and steel banded.